Salt Whistle Bay has almost nine months of trade winds for the November to July kiting season. Depending on when you visit, you can generally expect to have winds in the 18-24 mph range during this period for at least half of the days you are on the island. We have found the WindGuru forecast to be reasonably accurate in predicting which days have good kiting conditions. We also have a WindGuru Station with live wind reports (coming soon). % of days that are Beaufort 5+ (19 mph+) from WindGuru. We recommend you bring your larger kites, perhaps 11-13M and a 9-10M. We usually out with our 11M or 12Ms but occasionally will get a 22-24 mph day and use our 9M or 10Ms. All the spots in the area get essentially the same trade winds, more or less. Finally, there should be no problem bringing your board bag on the flights. If your bag does not fit on your flight you are on it will be on the next available flight. Of course we will assist you in making sure your luggage arrives to Salt Whistle Bay. We also have secure gear storage on the property. There are two kite schools on Union Island, Happy Kites and JT Pro Center. Both offer lessons, excursions, and gear repairs. 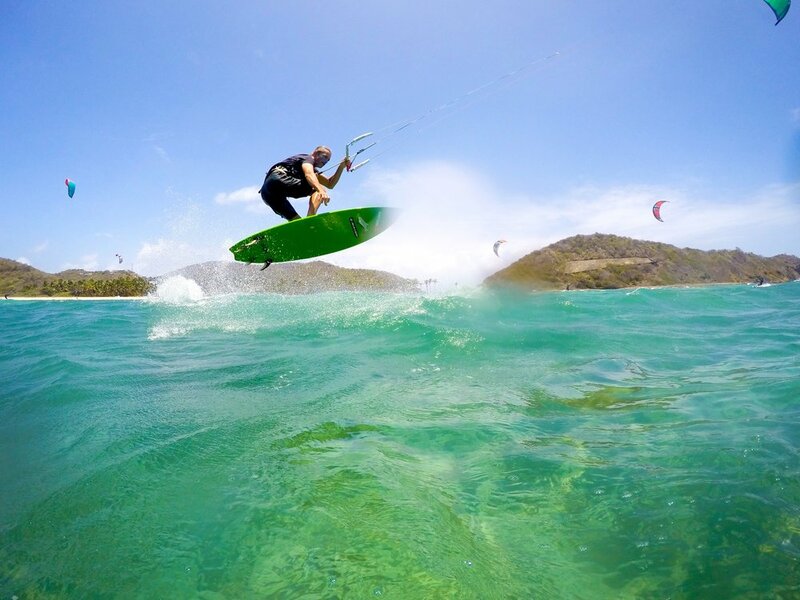 Happy Kite also provides transfers between Union Island and Salt Whistle Bay as well as lessons on Mayreau in a designated teaching area on the windward beach. We're committed to supporting local businesses as part of our mission of building a sustainable destination and therefore do not have our own kite school.